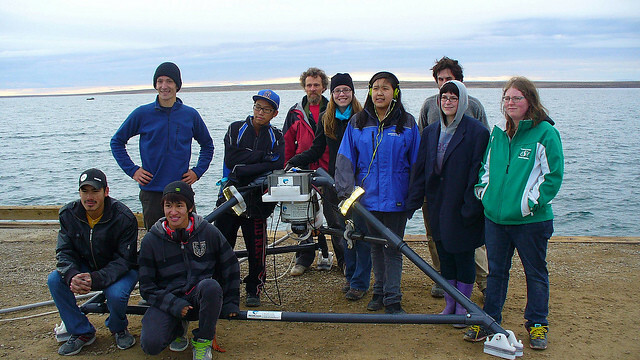 In September 2012, Ocean Networks Canada installed a cabled community observatory in Cambridge Bay, Nunavut—the first of its kind to be installed in Canada’s North. Each year, ONC teams travel to this northern hamlet for an important maintenance expedition to clean and upgrade the observatory infrastructure and instruments. It’s also a great opportunity to reconnect with the residents of Cambridge Bay. Right now, members of our engineering, science and outreach teams are busy preparing for our third visit, from 14-25 September. On his ninth annual week-long Northern Tour, the Prime Minister’s itinerary includes the Yukon, Northwest Territories and Nunavut, where he stopped in Cambridge Bay to learn about northern initiatives in ocean science and technology, including ONC’s cabled community observatory. Cambridge Bay, Nunavut, is a northern community of approximately 1500 people, situated in a dynamic Arctic environment. In August 2012, Ocean Networks Canada was granted a research license to operate a cabled observatory in Cambridge Bay. The installation was completed in September 2012, and data are now being collected continually. The Ocean Networks Canada Arctic observatory is located at approximately 69° North, in Cambridge Bay, Nunavut. The following data plot shows the return of sunshine after several weeks of darkness. Values are daily averages relative to Universal Coordinated Time (UTC). Previous posts have looked at chlorophyll concentration and ice thickness. Scientists from across North America gathered in Anchorage at the end of March to discuss one of the fastest-changing ecosystems in the world -- the Arctic. At the 28th Lowell Wakefield Fisheries Symposium, much of the buzz focused on the impact of rapid changes in the extent and duration of sea ice on marine mammals, fish stocks, and human activities.